In name, anyway. While “brontosaurus” conjures up a pretty familiar shape – one of the most recognizable dinosaurs, practically synonymous with the word “dinosaur” itself, the word, which means “thunder lizard,” hasn’t carried much scientific weight since the turn of the early 20th century, when it was decided that it bore too much resemblance to another genus of long-necked dinosaur – the apatosaurus, a sauropod which also roamed the Earth during the same Jurassic period. Brontosaurs became reclassified as apatosaurs, but the former was forever engrained in pop culture – even being printed on a series of U.S. mail issued stamps. However, over the past 20 years in the paleontological community, there’s been something of an effort to bring the name Brontosaurus excelsus back, and it looks like this movement might finally have some weight behind it. A recent analysis of sauropod skeletons across multiple related species now indicates that the original thunder lizard – Brontosaurus excelsus is distinct enough from Apatosaurus that the name may perhaps have a place after all, according to a team of paleontologists from the U.K. and Portugal. “We didn’t expect this at all at the beginning,” said the study’s co-author Emmanuel Tschopp of the Universidade Nova de Lisboa. The project started out as just a joint effort between Tschopp and his colleague Octávio Mateus of the Museu da Lourinhã as they worked on criterion for the diplodocid family tree – one of several branches of sauropod dinosaurs. The name Brontosaurus excelsus was first described in 1879 by the rather legendary Yale paleontologist Othniel Charles Marsh, in his rather understated paper: “Notice of New Jurassic Reptiles.” Marsh would later go on to name 80 new species of prehistoric creatures, much to the chagrin of his rival, Edward Cope, who often refuted the nature of his findings in a 20-year feud that would later be known as the Bone Wars. Cope identified 56 new species himself, including the skeletons of several seagoing Elasmosauruses, one of which he mistakenly put the head on the tail. 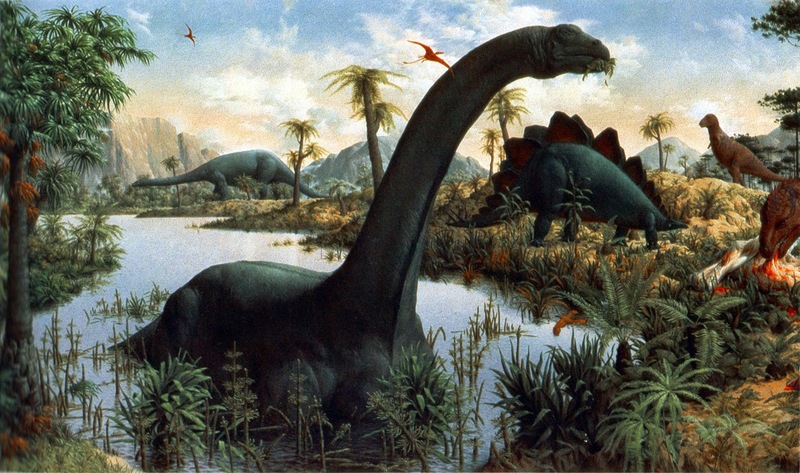 Marsh identified the first Brontosaurus in a layer of 150-million-year-old rock found in Como Bluff, Wyoming. This new “monster” was hardly the first long neck dinosaur to find a spot in Marsh’s massive fossil collection. Two years before, Marsh had already identified Apatosaurus ajax — known as the “deceptive lizard” – from out of a Jurassic rock layer in Colorado. New York City’s American Museum of Natural History built its first reconstruction of the animal in 1905, shortly after the paleontologist Elmer Riggs discovered that the biggest distinctions between Brontosaurus and Apatosaurus had to do with growth – perhaps Brontosaurus was just a juvenile Apatosaur. Because the Apatosaurus specimen was named first, it took precedence over Brontosaurus. Despite the extreme similarity between Marsh’s skeletons, Riggs recognized just a slight enough difference to designate separate species. The Apatosaurus ajax was kept in place, and the Brontosaurus became Apatosaurus excelsus. Museums took a bit of time to follow suit, but by the 1970s, most people had already accepted the change. Paleontology is quite a bit more frustrating than many of us imagine it to be. Amidst having to constantly update anatomical reconstructions – such as the T-Rex in tripod pose that dragged its tail – there’s also the difficulty of having to discern one species from another, with only a few fossilized remains to build on. To help them on this task, they turn to the discipline of cladistics. A slight flange on a bone could be the difference between two different species – and they assign these traits to a computer program that analyzes various skeletal samples. As the characteristics researched vary between researchers, it is up to them to then verify their findings after finding which family tree the extinct animal belongs to. Tschopp and his colleagues had sought to develop an updated family tree of the diplodocid dinosaurs, whose territory once spanned the western United States to modern day Portugal, by paying particular attention to how many known species they had of Diplodocus (known for sometimes growing up to 90 feet in length) and Apatosaurus. The researchers noted 477 different “anatomical landmarks” among 81 dinosaur specimens. While the shape of the family tree was largely supportive of what paleontologists already know – they found some interesting, however subtle differences. “The most obvious and visual feature would be that Apatosaurus has a wider neck than Brontosaurus,” he says, suggesting that while of incredible stature, the Brontosaurus was not as powerful as the deceptive lizard. The new results are based on a careful analysis of two Brontosaurus skeletons: the one that Marsh consulted when he coined the name, along with a second model that was identical enough to be considered the exact same species. In addition, Tschopp looked at an array of other bones thought to belong to Brontosaurus, which he re-examined with the diplodocid family tree of findings. So is the Brontosaurus back with us for good? Southern Methodist University paleontologist Louis Jacobs is impressed by the new study. “Numerous new sauropods have been discovered and named in the last couple of decades, new techniques have been developed, and we simply have a more sophisticated understanding of sauropods now,” he says. We’re not so much recycling old ideas, according to Jacobs, as we are refining our techniques for classifying prehistoric animals with just a few pieces of bone. Whether or not Brontosaurus will find itself again on museum labels depends on how consistent the findings are with similar studies conducted by other paleontologists. For now, however, there’s a question of how many other dinosaur taxa will stand up to the same scrutiny. Experts are already beginning to question whether another recognizable dinosaur Triceratops is really a distinct species from Chasmosaurus.